Gasare, Silicone Placemats, Kids Placemats, Non-slip Waterproof, Very Flexible Silicone, Assorted Colors, Size 16 x 12 Inches, Set of 4,Black by gasare at Amina Restaurant. MPN: TL16-black. Hurry! Limited time offer. Offer valid only while supplies last. Excellent gift idea. Gift wrap available. 100% Money Back Guarantee that you are fully satisfied with your product. These placemats have many uses. Excellent gift idea. Gift wrap available. 100% Money Back Guarantee that you are fully satisfied with your product. These placemats have many uses. 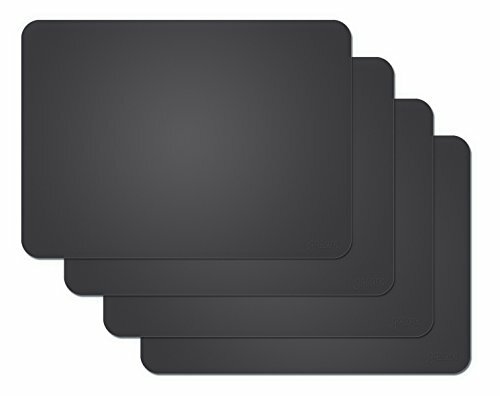 Some of these are: Use under decorative placemats to prevent slipping, to hold dishes for individuals with disabilities for increased independence, and also place it under your computer’s keyboard. Works great under food bowls for dogs and cats to avoid it from moving. It’s also perfect to do arts and crafts activities with kids along with many other things. Excellent for day care. It’s a color-fast and durable material that lasts for years. Bright attractive colors make changing your table decor very easy. Buy more than one set for different looks every day and occasions. If you have any questions about this product by gasare, contact us by completing and submitting the form below. If you are looking for a specif part number, please include it with your message.